Need help making sense of website accessibility? This eBook is the perfect place to start! Making your district's website accessible has always been the right thing to do. But, because the process of making your website accessible can be cumbersome and expensive, many districts have forgone formalities and did the best they could with what they had. This is no longer an option for public school districts and universities, as recent OCR investigations and ADA regulations are requiring that all federally funded educational institutions follow a strict set of regulations to make website content accessible. 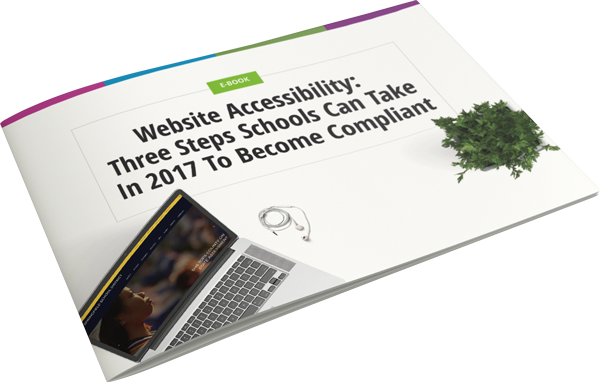 To help districts ensure their websites are accessible for all, we've partnered with Bernie Rhinerson, Former Chief of Staff of San Diego Unified School District, to provide knowledge and strategies in this free eBook.